Perry Lion Andy Bambrick, left, welcomed Catlin McDowell, an occupational therapist at the Dallas County Hospital who also manages the durable equipment loan program at DCH. The Perry Lions Club learned about the Dallas County Hospital’s new durable equipment loan program at its March 18 meeting courtesy of the program’s manager, DCH Occupational Therapist Caitlyn McDowell. 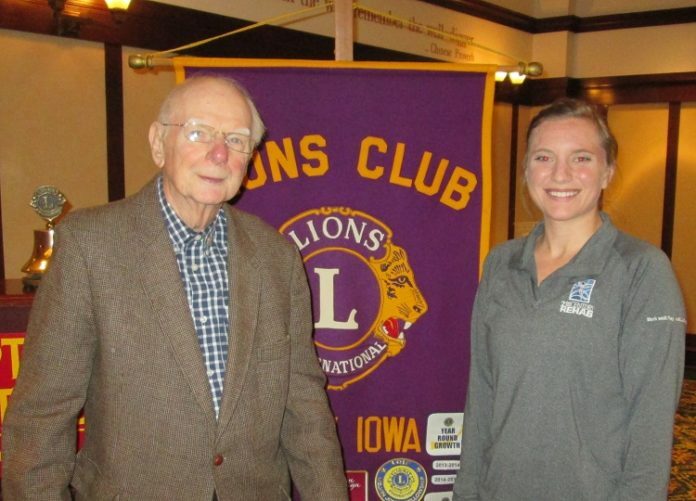 Following the meal of chicken fried steak, with green beans, mashed potatoes, and peanut butter brownies for dessert, prepared by Harvey’s at Hotel Pattee, McDowell gave a presentation to the 13 assembled Lions. A native of Jewell, Iowa, McDowell received her bachelor’s degree in occupation therapy from the University of South Dakota. She explained the Dallas County Hospital’s Durable Equipment Loan Program, which provides equipment such as wheelchairs, canes, walkers and shower seats to patients who might need them after being discharged from the hospital for recovering at home. These items are frequently needed but are not covered by insurance. McDowell said these items are loaned to the patient without charge. She also said the hospital will accept donations of equipment and will give a receipt for tax purposes. The members of the club found the program very informative.